After careful deliberation, we're happy to inform you that adae2remember.blogspot.com has made it in the guest list of #bloggys2015, Philippine Blogging Awards Gala Night. What a sweet breakfast surprise! Another 1st and exciting experience to look forward to this coming November! This is an opportunity to meet our fellow bloggers. I maybe a newbie in this field but I am ready to take a leap of faith. To be a part of the most awaited awards night is already something. This is going to be my first time to meet and greet our finest bloggers in town. To witness this special event in Philippine History, it's going to be adae2remember. Bloggys is a prestigious nationwide blog awarding event in the Philippines. It’s that time again to recognize the most relevant and engaging blogs owned and written by Real Filipinos from different parts of Luzon to Mindanao. 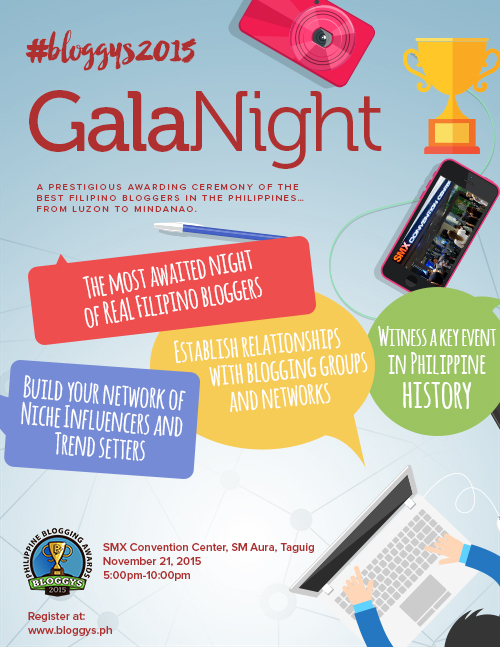 I am going to attend the Bloggys 2015 Gala Night! Hurray! Would you like to be a part of this key event in the Philippine history? Then go ahead and reserve your tickets before it runs out.